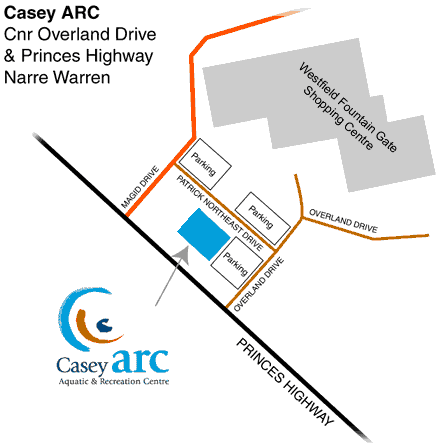 We are based at the Casey Aquatic and Recreation Centre (Casey ARC). The Casey ARC complex is situated on Patrick Northeast Drive between Overland Drive and Majid Drive, next to the Fountain Gate Shopping Centre, in the south-eastern Melbourne suburb of Narre Warren. It's just off the Princes Freeway at the Narre Warren exit. If coming from the Melbourne direction on the freeway, turn left (north) onto Narre Warren Rd, take the first left at the lights onto Majid Drive. This winds around the edge of the shopping centre. Continue through the first roundabout, past the shopping centre buildings and carparks on the left, go through the next roundabout and take the next left at Patrick Northeast Drive, in front of the new Bunjil Place building. The pool is on your right past Bunjil Place. The alternative way from the freeway is to turn south on Narre Warren Rd, right at the lights for Overland Drive and follow this through the shopping centre car parks and 2 roundabouts. At the 3rd roundabout, one of the car parks for the pool is straight ahead. Alternatively, turn left and then right onto Patrick Northeast Drive. The pool is on your left. The back of Casey ARC is next to the Princes Highway, between Majid Drive and Overland Drive. If coming along Princes Highway from the west (Dandenong side), turn left (north) on Majid Drive, do a U-turn at the first roundabout and take the next left at Patrick Northeast Drive, in front of the new Bunjil Place building. The pool is on your right past Bunjil Place. If coming along Princes Highway from the east (Gippsland side), turn right (north) on Overland Drive and take the first left (Patrick Northeast Drive). The pool is on your left.